Up to now, we have had to rely on written evidence for our story, but maps from the early nineteenth century onwards are detailed enough to show individual buildings clearly. 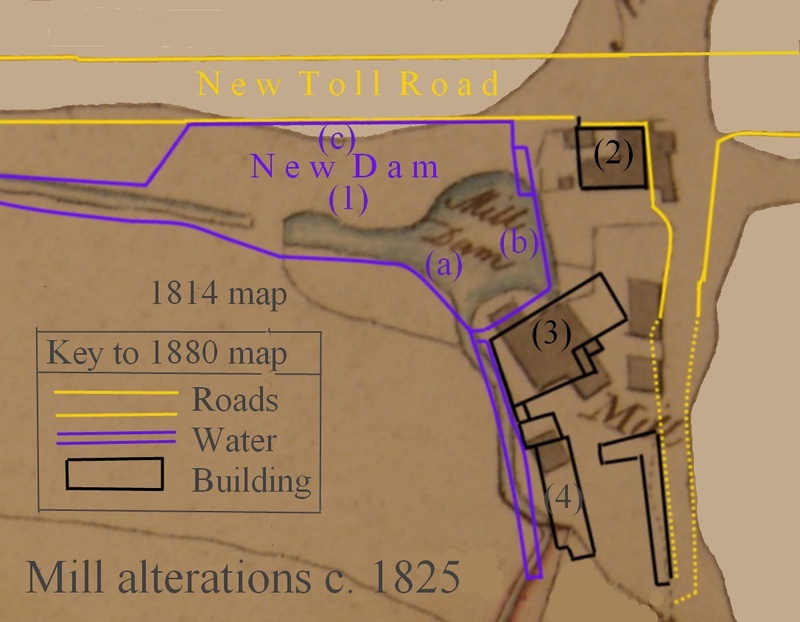 Those of the mill in 1807 and 1855 (above) show marked differences in both the buildings and size of the dam; (Abbeydale Road runs along the top of the maps with the mill building top right; the goyt, feeding water to the mill, runs in a big arc from the Sheaf, bottom left, to the dam top right) . What were these differences, when did they occur? The Dam (1) The banking facing the park (a) remained unchanged as did the wall (b), but the wall between them became part of the mill – a wooden footbridge giving access from side to side. The part opposite the banking (c) was extended to the edge of the new turnpike (now Abbeydale road) running alongside it for some 50 yards and (b) was extended to meet it; making its capacity at least three times greater. The outlet sluices for the wheel and waste goyte remained in the same place. The Miller’s house (2) – on two floors – has lost a wing to road widening, but gained a new bay making it square, possibly large enough to take two families. The mill (3) – on three floors – has lost two small extensions, but has been widened by some 10 feet to the left and 20 feet to the right. The left side of the roof has been extended and brought down a floor, to meet the chimney of the new boiler. Smaller Building (4) – on two floors – an apparently new building adjacent to the boiler house. We are currently searching the Wentworth papers in the City Archives for details of both the internal and external works, which should confirm the date of the current buildings to a date between the later map of 1814 and the The Iris advertisementof December 1828 describing the mill as being on lease with immediate possession with newly erected steam engine – i.e.about 1825. My ancestor John Oliver is listed in the 1841 census as living at Old Park Corn Mill in Ecclesall, and in newspaper clipping dated 7 Mar 1835 the marriage of Mr John Oliver of Ecclesall Mill, miller to Mrs Mary Rose of this place. Do you have any further information on the millers who lived and worked here?